The concept of outdoor living has led toward a rise in demand for flexible and multi-functional outdoor furniture. Leading manufacturers in the global outdoor furniture market are crafting eco-friendly furniture using MOSO bamboo that is more durable than oak. Transparency Market Research (TMR), in its new report, has listed key players operating in the global outdoor furniture market. These market players include HNI Corporation, Herman Miller Inc., Steelcase Inc., La-Z-Boy Incorporated, Kimball International, Inc., Inter Ikea Systems B.V., Century Furniture LLC, Brown Jordan International, Inc., Ashley Furniture Industries, Inc., and Agio International Co., Inc. The global outdoor furniture market has been projected to ride on a moderate CAGR throughout the forecast period (2017-2022). Revenues from the market are estimated to surpass US$ 1,600 Mn by 2022-end. Emergence of retro feeling is a major trend being witnessed in the global outdoor furniture market. Consumers are shifting their preferences back to crochet, natural, and woven styles, which add texture to all kinds of spaces. The woven trend is likely to move one step ahead of all trends, owing to the introduction of new & non-traditional colors offering fresh look, particularly in summers. Use of wood, and other natural materials such as teak and rattan, have gained increased momentum for producing outdoor furniture. Eco-friendly is becoming the integral part of mainstream outdoor furniture. Effects of toxic finishes, negative impacts of deforestation, and environmental concerns have compelled manufacturers in adopting green solutions. Some manufacturers of outdoor furniture have already commenced implementing strategies for green manufacturing processes. For example, IKEA has started operating up to 30 windmills in Härjedalen, Sweden, to place itself as an independent energy manufacturing company. 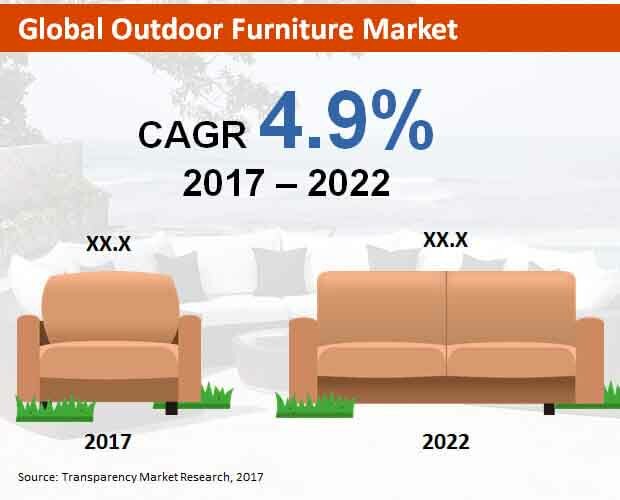 Textile will remain fast-selling material for manufacturing outdoor furniture across the globe, followed by wood and metal, whose sales are expected to register similar CAGRs through 2022. In contrast, sales of plastic for outdoor furniture will exhibit the lowest CAGR through 2022. In 2017, commercial end-users of outdoor furniture will account for nearly one-third share of the market, in terms of revenues. However, demand for outdoor furniture by commercial end-users will witness a slight decline by 2022-end. In contrast, demand for outdoor furniture by residential end-users is expected to rise significantly over the forecast period. Revenues from residential end-users of outdoor furniture will surpass US$ 4,500 Mn by 2022-end. Retail stores will continue to be the most lucrative sales channel for outdoor furniture, followed by direct to consumer channel. However direct to consumer channel will register a comparatively higher CAGR than retail stores in the market through 2022. Sales of outdoor furniture in e-commerce, discount stores and rental stores are projected to register an impressive expansion throughout the forecast period. By product type, dining sets will lead the global outdoor furniture market, in terms of sales expansion, through 2022. However, chairs, tables and seating sets are expected to remain more lucrative than dining sets, in terms of revenues. Revenues from sales of chairs, tables and seating sets are projected to account for over four-fifth share of the market throughout the forecast period. Asia-Pacific excluding Japan (APEJ) will remain at the forefront of the global outdoor furniture market, in terms of revenues. Between APEJ, Europe and North America, the market in APEJ will register a comparatively higher CAGR than North America, and a lower CAGR than Europe through 2022. Busy lifestyle leading to a lesser availability of leisure time has been encouraging people to enjoy outdoor living culture in these regions. Japan and Middle East & Africa will remain relatively less lucrative for growth of the outdoor furniture market.